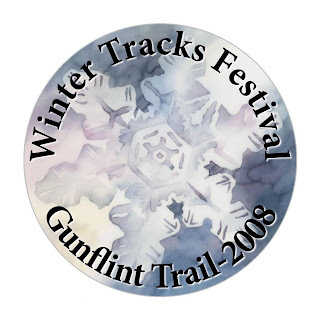 The Gunflint Trail's annual winter festival - Winter Tracks begin today and run through Monday, March 3. The event is put on by the lodges and people of the Gunflint to celebrates the "best of winter." This year along the Gunflint Trail you will find snow sculpture carved by local artist at Swamper Lake, Trail Center, Laurentian Divide and Gunflint Lake Overlook. Snow "huts" are displayed at Bearskin and Trail Center. You can find local artwork for sale during Winter Tracks at Bearskin Lodge, Trail Center, Gunflint Lodge and Gunflint Pines Resort. The festival's grand prize is Nancy Seaton's orginal art work- "A Snowflake" a copy of which is on this year's Winter Tracks button (above). Seaton's painting will be award at a drawing from Winter Track participants following the festival. Events begin at Golden Eagle Lodge at 10 am today with an introduction to snowshoeing and a guided trek followed by "knit by the fire" at Heston's Lodge from 2-4 pm. See all the events scheduled for Winter Tracks at http://www.wintertracks.com. Lutsen, Minnesota ─ The newly-formed Cook County Events and Visitors Bureau, in partnership with Gunflint Trail Association members, today announced the Second Annual Mush for a Cure Fun Run to be hosted on the Gunflint Trail in Grand Marais, Minnesota Saturday, March 15. The Mush for a Cure Fun Run is a non-competitive sled dog race that will raise funds to support the National Breast Cancer Foundation. Mush for a Cure is a celebratory season-ending race intended to celebrate the history of dog mushing along the Gunflint Trail and raise awareness about women’s health and wellness. Accomplished dog musher Mary Black and Gunflint Trail resident Sue Prom founded Mush for a Cure by combining their desires to help support efforts to find a cure for breast cancer. In 2007, Prom created a special bent-shaft Pink Paddle to raise money for the National Breast Cancer Foundation and in 2007, Black and Prom teamed to coordinate the 1st Annual Mush for a Cure. There is a mandatory entrance fee of $50.00 for all racers that will cover the cost of trail permits and insurance. Participants are encouraged to secure individual pledges above and beyond the entrance fee in advance of the event as part of the fundraising campaign. Promoting the event and collecting pledges is the responsibility of the participant and is to be presented during the same-day registration. 12:00 Noon start Gunflint Pines Resort on Gunflint Lake. Finish at Trail Center Lodge on Poplar Lake on the historic Gunflint Trail. collected during registration the day of the event. the “Reserve a Parking Space” or e-mail info@MushForACure.com for more information. All donations should be made payable to Mush for a Cure. Visit Gunflint-Trail.com or call (888) 922-5000. Musher check-in and registration opens at Gunflint Pines Resort at Gunflint Trail mile 43. Mass Sourdough Start on Gunflint Lake. Center Lodge at Gunflint Trail mile 30. Teams finish at Trail Center Lodge. The Finishers Bonfire and Dance Party tent are sponsored by Sarah Hamilton and the gang at TrailCenter Lodge. Enjoy hot dogs, cider and marshmallows while the teams are finishing! The Closing party is at 7:00pm with live music by “Rod and Reel” at the Trail Center Lodge. Awards presentation for largest pledge collector(s), most outrageous pink outfit and best Five Card Stud poker hand. There will also be a special drawing with prizes. JOIN OTHER FRIENDS OF THE GUNFLINT TRAIL planting trees along the Gunflint Trail during the Gunflint Green Up . For Green Up Specials at Poplar Creek Guesthouse B&B and Cabins - go to Reforesting the Gunflint or call 800-322-8327. Skiing the Banadad, Firepot Dinner at a Yurt, Sleigh Ride and Snowshoeing featured on this morning's "Good Morning America." To view go to "winter on the Gunflint. and then click on "weekend window" on the upper right hand side of your screen. harbor village of Grand Marais and the historic Gunflint Trail. The shoot took place February 12th and 13th , and notification came today that this segment will air during the last 5 minutes of the hour-long program this Sunday, February 17th . Producer Jennifer Pirone selected three activities up the Trail for the project. The cross country ski adventure features five skiers –skiing the Banadad Ski Trail to the Tall Pines Yurt for a Mongolian firepot dinner. The skiing activity was hosted by Boundary Country Trekking. Next was the nostalgic sleigh ride with 2,000-pound Belgian horses and a lantern-lit trail at Okontoe Family Campground. It was a “wrap” with snowshoeing at Pincushion Mountain, with its Lake Superior backdrop. Local citizens provided the “talent” for the activities as well as the narrative to describe just how terrific a winter in the area can be. then scroll down to GMA Weekend). See for yourself why our winter wonderland is among Good Morning America’s choices for “one of the most beautiful places in America”. At Gunflint Lodge we are in the process of trying to transition from one generation (Bruce & Sue Kerfoot) to the next (Me). The resort does not generate anywhere near the necessary cash flow to pay for the shares of the resort my father owns, even at a severely discounted rate. We need to come up with the financing to pay for this transition. We will be taking 13 of our already existing cabins (there will be NO new construction) and creating a planned unit development. The cabins in the PUD will be sold as 1/5th fraction, which is technically a timeshare. We will be protecting all of the open space in the PUD so it can not be built on in the future. Once these cabins are sold Gunflint Lodge will be the management company and will rent these cabins. To someone eating in our restaurant or just renting a cabin, nothing will look different then it does now. It will continue to look and operate as one resort called Gunflint Lodge. Some of the cabins will have multiple owners, but Gunflint Lodge will be cleaning them and making sure they are properly maintained. Obviously since we will be renting the cabins in the PUD it is in our best interest to ensure they stay in good shape as they would reflect back on the rest of the property. The alternative to not doing a timeshare is to either sell some of the land (which will ultiately be developed by whom ever purchases it), or to do a residential planned unit development (which has other significant negative implications), or we could build a hotel (again this has many negative implications). We have no interest in doing any of these, and we believe by creating the proposed Planned Unit Development it will keep things the same and the property will not significantly change. In summary we will be building NO new cabins, we are trying to change things as little as possible, we do not want to build a hotel, or ask for a residential PUD, and we will be protecting in perpetuity all of the common space inside of our proposed PUD. Additionally we told the Gunflint & Loon Lake Home Owners association about this at their annual fall meeting. Furthermore we also told the Gunflint Trail Association about our plans at their annual fall meeting. If you would like to discuss any of this further please call me and I will be happy to answer your questions as best as I can. At Trail Center additional evening activities will include live music and a bonfire. The planned race format will be “poker run style”- at check points every few miles; mushers will receive a card- Finisher with the best hand will wins prizes. Teams are limited to 5-8 dogs. A three-person production crew from the TV show "Good Morning America" video filmed on the Gunflint Trail and along North Shore this week. The production crew’s first stop was at Poplar Creek Guesthouse B&B where they filmed skiers traveling along the Banadad Ski Trail to the Tall Pine Yurt. The crew then filmed the skiers arriving at the yurt and next inside the yurt enjoying Boundary Country Trekking’s Mongolian Fire Pot Dinner. Local skiers who served as models for the production were Jan Sivertson, Peter Monkres, Jan Lemke, Debbie Benedict, and Barbara Jean Meyers. 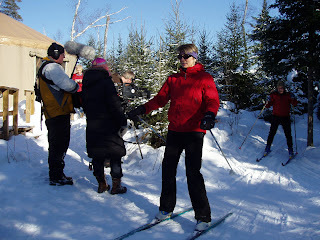 The following day the production crew were guided on a snowshoe hike up the North Shore’s Kedunce Creek by Kelly Dupre and Judie Johnson. The hike took them along the creek’s scenic deep gorge and past “caves” and water falls. It is expected that "Good Morning America" will be airing the production sometime within the next few weeks. The Twenty- fifth running of the Beargrease Sled Dog Race is now history. Jason Barron of Lincoln Montana came in first followed by Duluthian John Stetsen. The only musher from Cook Country finishing the race this year was Rita Wehseler of Tofte who came in ninth. What this years race will perhaps be most remembered for is the mid race rain. When the race started on Sunday the snow conditions were good and the weather was mild. Monday, the second day into the race, sometime after 9:00 p.m., depending where you were along the race route, it began to rain- correction it poured. According to the crossing- guard stationed at the Lima Grade’s turn onto the Little Ollie road enroute to Trail Center over an inch of rain accumulated in his upright plastic sled. The result was of the twenty-seven mushers that started the race fifteen “scratched” –most, seven, at Trail Center during the thick of the rain. Following the rain the temperature plummeted to below zero. One musher pretty much summed it up, “I had to quit, it wasn’t because the dogs and I were completely wiped-out, it was because I was soaking wet and cold and not sure how in the world I was ever going to warm-up enough to continue the race”. At the Trail Center, the race “turn-around,” Sarah Hamilton, even with the rain, was up beat about the race. “It was a great boost- financially and emotionally but” according to Hamilton, “ we would be open for the race even if we did not make any money.” Hamilton noted she served over three hundred meals during the race and estimated the turnout of spectators, racers, handlers, Beargrease officials and the media at Trail Center was over six hundred people. Trail Center remained open all Monday night as the musher came in, rested and headed back to Duluth. Along the Little Ollie Road Jim Ross spent most of Monday night manning a campfire and watching the musher as they passed by his cabin Further down the road, Joannie Nickols rather then disrupt the race by driving her car from her cabin to Trail Center, skied over. As she approach Trail Center with her headlamp lighting her way she was mistake by the awaiting crowd as one of the dog teams arriving. However the spectators could not figure out why this “team” was traveling so slow. When she shouted at them that she was a skier, the crowd jokingly booed. And at Poplar Creek Guesthouse B&B handlers for one of the mushers waited for his arrival. Post Scribe by Ted Young- Barbara and I arrived at Trail Center shortly after 8:00 p.m., on Monday several of the teams had already came in. The rain was beginning to fall. There was a great festive crowd including many of our Gunflint Trail neighbors. It is clear that the Beargrease really is an important addition to the Gunflint Trail each winter. We are lucky to have this exciting event and to have Trail Center as the turn-around. Also it should not be forgotten that the historic inspiration and organization of the Beargrease goes back to the Gunflint Trail Mail Run Dog Sled Race held along the Gunflint from 1977 until 1980.